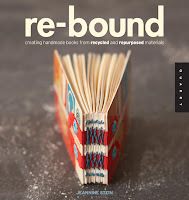 There is a new book published by Quarry Books: re-bound by Jeannine Stein. And I'm in it! This is an instructional book that focuses on making books using entirely recycled and upcycled materials. I was pretty excited to see this book is now available. The book includes sixteen fully illustrated bookmaking projects, ideas for gathering materials and supplies, as well as a "beautiful gallery of other rebound creations by leading artists offering further inspiration" and that's where you can see a bit of my work in there! Congratulations! I'll be checking it out asap. it's beautiful, myhandbound! can't wait to see you in it! congratulation! not sure this book is available in austria, but it sounds very interesting. I love your website. I read it on my lunch breaks and it's such a treat and encouragement to me. Thank you so much, or as we say in Hawaii: Mahalo Nui Loa!